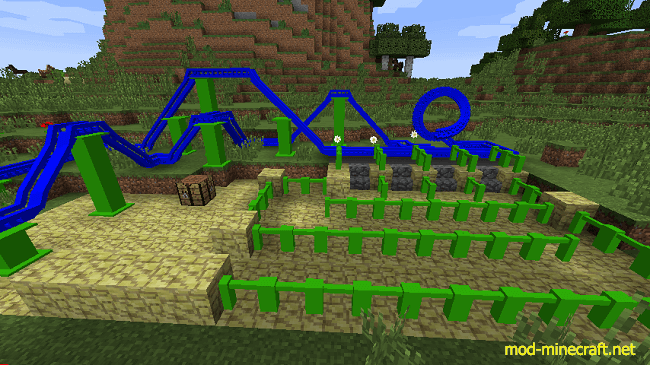 Rollercoasters Mod is all about building roller coasters that look cooler than the vanilla Minecart rails. We plan to add a variety of track elements such as cobra rolls, helixes and hanging track. Eventually, we also plan on adding roller coaster trains that will be fully changeable from the paint to the wheels. You will be able to ride these like normal minecarts. We hope that people will enjoy being able to create cool roller coaster tracks especially with what we have planned for the future. We also have some decorative blocks to help build a realistic looking theme park. There are also a variety of fence types available to add to your rides.